This tutorial explains how you can alternate row colors in Excel to automatically highlight every other row or column in your worksheets. You will also learn how to apply Excel banded rows and columns and find a few smart formulas to alternate row shading based on a value change. It is a common practice to add shading to alternate rows in an Excel worksheet to make it easier to read. While it is a relatively easy job to highlight rows of data manually in a small table, it could be an arduous task in larger ones. A better way is to have row or column colors alternated automatically and this article is going to show you how you can quickly do this. 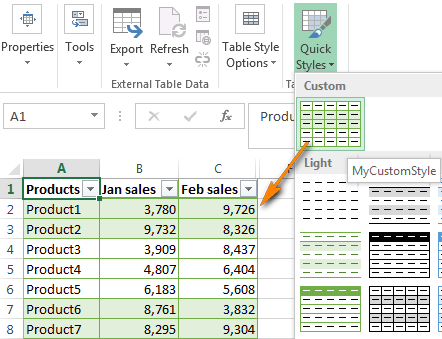 When it comes to shading every other row in Excel, most gurus will immediately point you to conditional formatting, where you will have to invest some time in figuring out an ingenious mix of MOD and ROW functions. If you'd rather not use a sledge-hammer to crack nuts, meaning you don't want to waste your time and creativity on such a trifle as zebra striping Excel tables, consider applying the built-in table styles as a quick alternative. 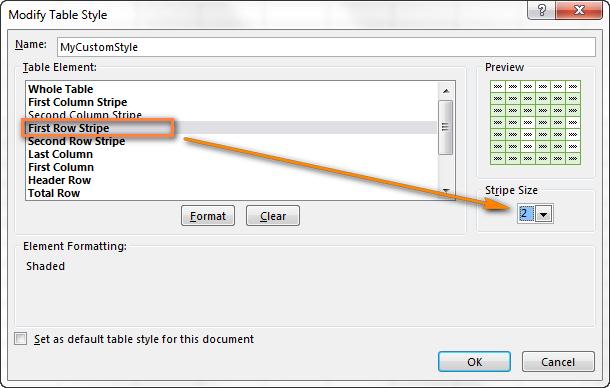 The fastest and easiest way to apply row shading in Excel is by using predefined Excel table styles. Along with other benefits of tables such as automatic filtering, color banding is applied to rows by default. All you need to do is convert a range of data to table. 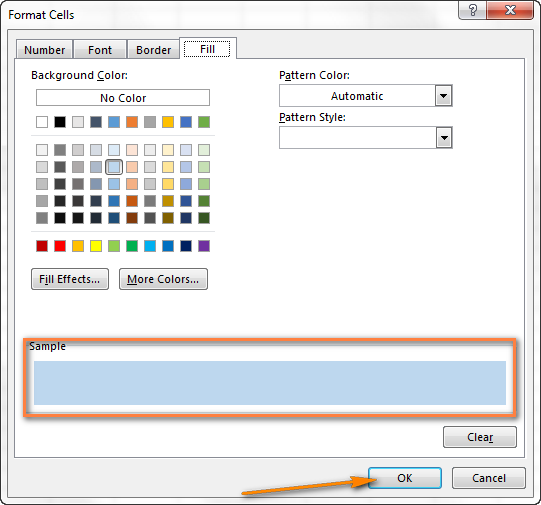 Select the range of cells where you want to alternate color rows. 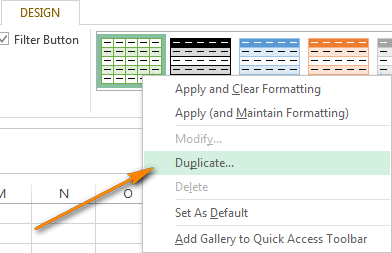 Navigate to the Insert tab on the Excel ribbon and click Table, or press Ctrl+T. Done! The odd and even rows in your table are shaded with different colors. The best thing is that automatic banding will continue as you sort, delete or add new rows to your table. If you'd rather have alternate row shading only, without the table functionality, you can easily convert the table back to a usual range. To do this, select any cell within your table, right click and choose Convert to Range from the context menu. Note: If you opt to convert a table to range, you won't get the automatic color banding when you add new rows to the range. Another disadvantage is that as you sort the data, i.e. move certain cells or entire rows within the range, your color bands will travel with the original rows and your nice zebra stripe pattern will get distorted. As you can see, converting a range to table is a very easy and quick way of highlighting alternate rows in Excel. But what if you want a bit more? If you are not happy with the default blue and white pattern of an Excel table, you have plenty more patterns and colors to choose from. Just select your table or any cell within the table, switch to the Design tab > Table Styles group and select the colors of your liking. You can use the arrow buttons to scroll through the available table styles or click the More button to view them all. When you hover the mouse cursor over any style, it is immediately reflected to your table and you can see how your banded rows would look like. Navigate to the Design tab, right click on the table style you want to apply and choose Duplicate. In the Name box, enter a name of your table style. 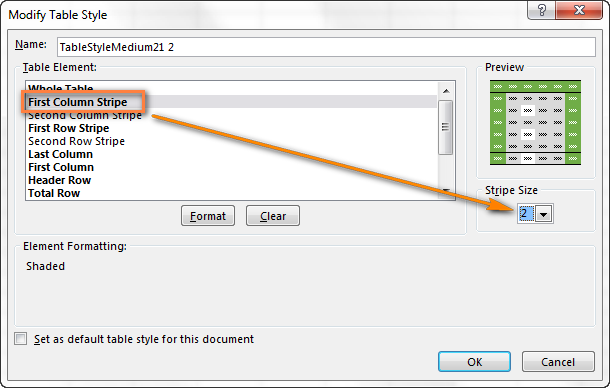 Select "First Row Stripe" and set the Stripe Size to 2, or to some other number you want. Select "Second row stripe" and repeat the process. Click OK to save your custom style. Apply the newly created style to your table by selecting it from the Table Styles gallery. Your custom styles are always available at the top of the gallery under Custom. Note: Custom table styles are stored only in the current workbook and therefore are not available in your other workbooks. 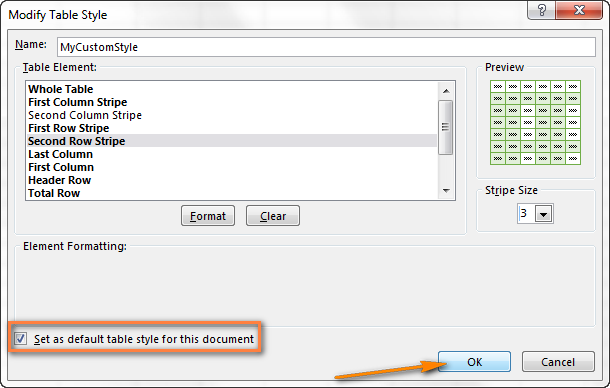 To use your custom table style as the default table style in the current workbook, select the "Set as default table style for this document" check box when creating or modifying the style. If you no longer want to have color banding in your Excel table, you can remove them literally in a single click. Select any cell in your table, go to the Design tab and uncheck the Banded rows option. As you see, Excel's predefined table styles provide a wealth of features to alternate color rows in your worksheets and create custom banded rows styles. I believe they will suffice in many situations, though if you want something special, e.g. shading entire rows based on a change of value, then you will need to use conditional formatting. We are going to start with a very simple MOD formula that highlights every other row in Excel. 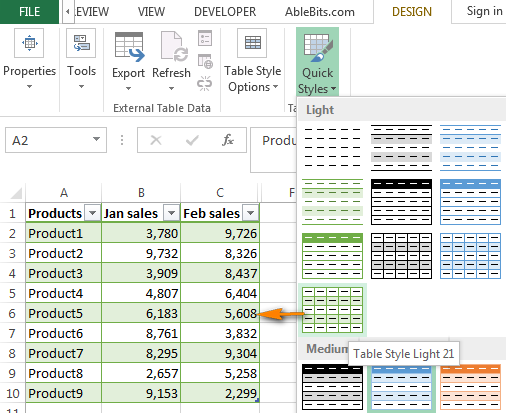 In fact, you can achieve exactly the same result using Excel Table styles, but the main benefit of conditional formatting is that it works for ranges as well, meaning that your color banding will remain intact as you sort, insert or delete rows in a range of data to which your formula applies. Select the cells you want to shade. To apply the color banding to the entire worksheet, click the Select All button in the top left-hand corner of your spreadsheet. Then click the Format button, switch to the Fill tab and select the background color that you want to use for the banded rows. At this point, the selected color will appear under Sample. If you are happy with the color, click OK. This will bring you back to the New Formatting Rule window, and you click OK one more time to apply to color to every other of the selected rows. That was pretty easy, wasn't it? And now I'd like to briefly explain the syntax of the MOD function because we are going to use it in other a bit more complex examples. The MOD function returns the remainder rounded to the nearest integer after the number is divided by the divisor. For example, =MOD(4,2) returns 0, because 4 is divided by 2 evenly (without remainder). Do you see the pattern? It's always 0 for even rows and 1 for odd rows. And then we create the conditional formatting rules telling Excel to shade odd rows (where the MOD function returns 1) in one color and even rows (that have 0) in another color. Now that you know the basics, let's look into more sophisticated examples. Where RowNum is a reference to your first cell with data and N is the number of rows in each banded group. Tip: If you want to highlight both even and odd groups, then simply create 2 conditional formatting rules with both of the above formulas. You can find a few examples of formula usage and the resulting color banding in the following table. Remember to replace A2 with a reference to your first cell with data. This task is similar to the one we discussed a moment ago - shading groups of rows, with the difference that there may be a different number of rows in each group. I believe, this will be easier to understand from an example. Suppose, you have a table containing data from different sources, e.g. 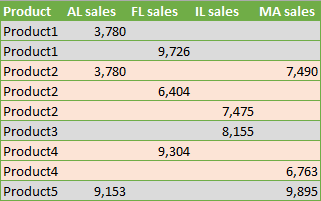 regional sales reports. What you want is shade the first group of rows related to the first product in Color 1, the next group related to the second product in Color 2 and so on. Column A listing the product names may serve as the key column or unique identifier. Create an additional column over the right side of your worksheet, say column F. You will be able to hide this column later. The formula will fill down column F with blocks of 0 and 1, every new block staring with the Product name change. You start with converting a range to a table (Ctrl+T). Then switch to the Design tab, remove a tick from Banded rows and select Banded columns instead. Voila! Your columns are shaded with the default table colors. In case you'd like prettier colors, you are free to choose any other pattern from the Table Styles Gallery. If you want to shade a different number of columns in each stripe, then create a duplicate of an existing table style of your choosing, exactly as described here. The only difference is that you choose "First Colum Stripe" and "Second Colum Stripe" instead of the corresponding row stripes. The formulas to apply color banding to alternate columns in Excel are very similar to the ones we've used for shading alternate rows. You just need to use the MOD function in conjunction with the COLUMN function rather than ROW. I will name but a few in the table below and I'm sure you will easily convert other "row formulas" to "column formulas" by analogy. Hopefully, now you won't have any problems with applying color banding in Excel to make your worksheets handsome and more readable. If you want to alternate row or column colors in some other way, don't hesitate to leave me a comment and we will figure this out together. Thank you for reading! 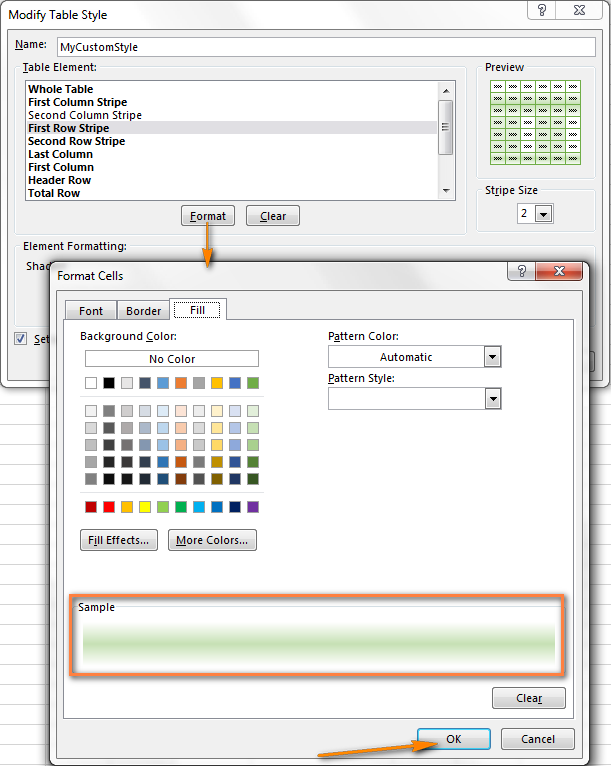 57 Responses to "Alternate row color and column shading in Excel (banded rows and columns)"
Now when you change the row order by using the dropdown widgets on a column, the alternate table colors are lost. This is very strange. The alternate colors should be preserved when you sort or filter table rows. Can you please specify what method you used to highlight rows and what is your Excel version? I'm sure I could have figured out the "Based on value change" version sooner or later. Maybe. Thanks for making it so simple! I want to shade every other visible row using the Mod function with a conditional format. What is a good formula to use? Where A2 is the left-most cell of the range you want to shade. I came across a problem when I used the formula pertaining to "alternate row shading based on value" and appreciate if you could assist. The shading is off by one row and highlight the row before. Most likely one extra row was somehow added to the applied range. If this is not the case, please send me your workbook at support@ablebits.com and I will try to help. I am really thankful for this tip..=MOD(IF(ROW()=2,0,IF(A2=A1,F1, F1+1)), 2)!! It made my sheet become alive..!!! You can no longer use a color fill on the rows where the conditional formatting is true. If you filter, you can get rows with the fill adjacent to each other defeating the point of the banded rows. Use a table, when you can. Tables have lots of built in features that make them extremely powerful tools. Thank you for your comment, Johann. You are absolutely right, a table is a very powerful Excel tool. With many power users, pressing СTRL+T on new data is an instinct rather than a habit. But a lot of users, especially beginners, continue working with ranges, that's why in this article we've covered both ways. I just wanted to say THANK YOU, THANK YOU, THANK YOU!!!! I have been trying to figure out a way to do banded rows based on a value change FOREVER! You are amazing!!!! Thank you so much!!!!!!!!!!! I, too, have the issue where the formula calculated accordingly (Like Jo), but when applying the conditional formatting to shade/not shade when the value changes, the SHADING is off by one. For example, it is highlighting the last record from the previous set, which causes the entire shading pattern to be off by one. Any help you can provide would be greatly appreciated. If this does not work, you can send me your worksheet and I will try to help. How does that work for every row. Does it know to check the value as you go? First off, I apologize for my misprint, it should be "formula is written for the _top_ left cell of the range". I meant to say that in conditional formatting rules, a formula should always reference the left-most cell of the range to which the rule applies. For example, if you are creating a rule for cells A1 through A10, you write =$A1=1; if your range is A2:A10, then your formula is =$A2=1. If you are creating the rule for A2:A10, but your formula says =$A1=1, the shading will be off by one row, as reported by Dio. >Does it know to check the value as you go? Yes, Excel adjusts the formula for all other rows like when you drag the formula down a column, provided that you use correct cell references (absolute vs. relative) in your formula. is there a way to keep a pop up box on the side or something that will be visible when opened/instantly that shows "our" meaning per color we've selected for each row? Our employees are not aware or will remember the colors and the meaning to the info they are viewing. Thanks. I want to create hyperlink in first cell or every row in a sheet and cell value should be used as hyper link .We are using excel template and filling data to it using POI java . Is it possible to have the color function, and still be able to use Conditional Formatting? For example, I have a To-Do Excel Log, which I love having colors, one row one color and the next row a different color. BUT, I would to use Conditional Formatting to highlight the text of the items that are do TODAY or that are PAST DUE! Is that possible? when sorting a database with alternate fill colors? Hi, I can't get this to work - not even the most simple formula =MOD(ROW(),2)=0 doesn't do ANYTHING. I'm in europe so I replaced the comma with a semicolon: =MOD(ROW();)=0 Still nothing. Thanks Svetlana, just what I was looking. Excellent article! Hi Svetlana, this is exactly what I've been looking for all day. Thanks so much for your help! Great tips, Svetlana! However, what if I want to use more than just 2 alternating colors? What if I want to use 3 colors? (For example: blue, red, and yellow rows.) I searched Google, but can't find anything on this. Thanks in advance for your help! Please see How to shade rows with 3 different colors. I wanted to use a banded style with a stripe size of 4 for row 'and' columns. Modify Table Style just doesn't work -either rows are banded or columns are banded -but not both. 1. Home (menu)->Styles (group)->Format as Table (pull down)->New Table Style. 3. Oops-only row 'or' column banded stripes -not both ! hai Svetalana, i can not make three colours row like in this article. could u please fix my sheet , thank you very much. For us to be able to assist you better, please describe your task in more detail. Thanks for the article. I was able to apply your 'How to alternate row colors based on a value change' by using a 'key field' and when the key field value changed to then trigger the conditional formatting. - when the third group of rows have the same key, they then have condition = 0, and we repeat the cycle on and on. Thanks for the great information to get me on the path. How do you have a different shading for 4 different colors every 4th row? Your examples only cover up to 3 rows. I need 4 rows. But if you also have another formula for every X rows, that would be nice. 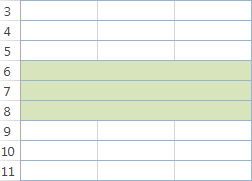 Also, how do I make it so that I can start from a certain row and finish at a different row (not the whole spreadsheet). Currently, I just highlight the section I want to do and the highlights stay within the selected area at the time I applied the rule. 2) Put in cell N2 1 or any (small number), which is the starting row of your band. 4) Copy down the formula from A1 (by dragging the little black cross at lower right corner of A1) from A2 to A20. Experiment by changing the values in N1 (=band width) and N2 (1st row to highlight) to see the differences. Is there a way to do it without adding new column ? 20/6/2015 in color #1 (no dates between 16-20/6/2015). I am trying to shade every other visible column in a rage using the Mod function with a conditional format. What is a good formula to use? I have 2 columns of data to work with. The left column features the numbers 0,1, and 2. I have conditionally formatted this column to show 0 is red, 1 is yellow, and 2 is green. Is it possible to get the right hand column to show the same colour as the left? I.e. If B4 = 2, I want C4 to be green. 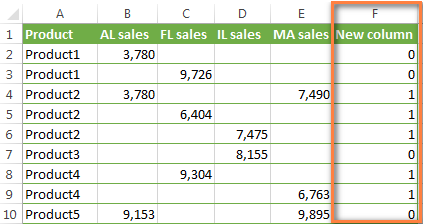 Can I apply this formula (MOD(IF(ROW()=2,0,IF(A2=A1,F1, F1+1)),2)) to a pivot table? Is there a way to retain the 2 colour banding when copying or dragging data or formula down the sheet? When I do it, whatever colour the cell I am copying from is pasted onto the cells below. i have to highlight the cell that contains formulas in entire sheet or selected area. OMG. Been searching for this (=MOD(ROW()-2,4)+1<=2) for an hour. If i'm tracking my Coverage % and FAIL%. If my coverage is 50% and I'm seeing 15% FAIL how i can show a cell have 15% RED and 35% GREEN. Can we do this in a cell Please help me. How can I make shade and color both columns and rows at a time. I badly want to make my excel sheet an organised one. In my excel I have column for document statuses. For which one at a time changes ofcourse depends on it's status. Is there any formula for which colours in a row with a specific status (word) can be changed? I have tried some formula but only one cell changes it's color. you need to create conditional formatting rules with simple formulas. For example, you want to highlight the first row of you table (A2:H2, for example) with green if H2 contains "Yes". 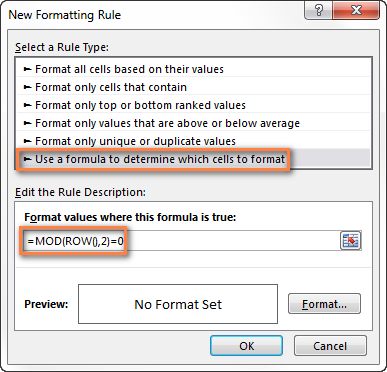 The formula for the formatting rule will be H1="Yes" and it should be applied to A2:H2. Please read this article to see how the conditional formatting rules work, are created and applied. Please try using a VBA macro. We are always ready to help you, but we do not cover the programming area (VBA-related questions). You may try to find the solution in VBA sections on mrexcel.com or excelforum.com. Sorry we can’t assist you better. How to install colored lines in changing with noncolored lines under the page brake rules? To correct all 2000 lines to move several page brakes is not fine. the easiest way I know is by intorducing the following formula as a new rule in conditional formating: = =indirect("A"&ROW())="Product1" and ofcourse choose a color for this selection. I hope it hels as the examples above are too complicated or not selective enough.